It’s been quite awhile since I made the decision to keep the 530G/Enlite (pump/CGM) system. If you followed me through the process earlier in the year, you know it was not an easy decision. Not by a long shot. But I gave it every benefit of the doubt during my trial, and the Medtronic team tried really hard to get me to like it. And you know what? It worked. Over the past several months, I’ve really grown to like the system and have been very comfortable with my decision. The sensor works well for me, and I understand how to make it well. The pump is comfortable and familiar, and talks to all of my other devices. The CGM is not as lumpy as its biggest competitor, and when I get out of the pool or ocean and back in range of the receiver-pump, it backfills the last 40 minutes of readings so i know what’s going on. The ISIGs give me a window into the CGM’s workings and lets me know if my sensor is performing well even if it’s got a bad calibration. The proprietary non-Luer connector makes the reservoir easier to fill than with the more common method. The pump’s raised blister-like buttons make it easy to operate without looking at it (don’t try this at home). And the clear/white case gives it a cool and modern look that I had never before anticipated – nor cared about. And CareLink! Try to take it away and replace it with another pump or CGM, and you’ll be in for a fight. And now, after all of the angst and turmoil of my trial, they’re telling me I can’t keep it. They is my insurance company — an insurance company that has treated me fairly since I first got on one of their policies 17 years ago. I’ve changed employers, plans, and coverages, but always were fortunate to have the same company administering them. They, through my current (wife’s) employer-sponsored plan, have been really good at providing coverage to keep me healthy rather than simply keep me alive until the next open-enrollment period. They even tell me I’m eligible for a new pump every three years, despite the typical warranty lasting four. They’ve been awesome. But they – the company I’ve never before mentioned by name (and I’m still not sure what the blogger etiquette is regarding such mentions, but their initials are UHC) doesn’t want me to have the 530G or Enlite sensor. They will only buy me an older, more obsolete Revel. Following Medicare’s lead, apparently. They (Medtronic, not UHC) tell me that the 530G, with its Enlite sensor and its Threshold Suspend, is considered by them to be “Experimental”, and thus not proven. This stance completely disregards the FDA approval on the device. They tell me that UHC’s beef with the new pump is the claim of (please resist urge to throw something, break something, or scream) “Artificial pancreas technology.” Apparently, that hasn’t been proven to work effectively yet. (Ya think??). The only thing this pump has that my last one didn’t have is an updated CGM algorithm and Threshold Suspend. To be honest with you, I could do without the Threshold Suspend. With the way I have my alarm thresholds set up, I’d have to ignore a myriad of “Low Predicted” and “Low” alerts before the Suspend kicks in without me knowing. I’ll admit, the TS does kick in sometimes, but in every case, I’ve already caught it, treated it, and (probably) manually suspended my basal. It’s really just a nuisance feature to me. If they could disable the TS but keep the Enlite and updated algorithms, and approve the pump, I’d be happy. If they need to make me sign an affidavit that I’ll keep the TS feature turned off to get approval, I’ll do it. (and I never lie! wink, wink). If they need me to go through some absurd appeal process, which likely means having my doctor get on the phone with UHC and have some sort of “Peer-to-Peer” review (he’s already provided the ubiquitous Letter of Medical Necessity), I’ll try to make that happen. This seems to be my most realistic, though least appealing, approach. Or I could wait for Medtronic’s insurance-negotiation-team (or whatever they’re called) to keep working with UHC (on behalf of all patients/policyholders, not just me) until they finally convince them that it’s still an insulin pump, only a newer model that works a little better. And try to hang on to my loaner/trial pump for just a little longer (I’ve already had it for too long). That’s another option. Or I could enroll in their “Pathways” pump upgrade program, in which I get to trade my Revel in for a 530G for $400, but keep the warranty (the whole five remaining months) that I have now, And pay out-of-pocket for sensors. Not worth considering. Or, I could save my energy, give up the fight, and go back to my black Revel. Only this time with a Dexcom, because after trying the Enlite, I really can’t stand the thought of going back to the Sofsensor. (But I also really don’t want to go with Dexcom, for reasons I’ve stated bef0re). This, sadly, seems like the most probable outcome. When I first heard of this, and the possibility struck me as reality, I can’t describe to you the feelings of frustration and disbelief and anger that came over me. I felt teased and misled and abused and lied to. And for the first time in 33 years with diabetes, I felt victimized and helpless. I can’t say who, exactly, is to blame for the feelings I described in the above paragraph. It was more due to just the situation, the enormity and dysfunctionality of the whole system, and not one particular entity who is at fault. In honesty, I was warned that UHC has a history of denying coverage for the 530G, but they’ve always been good to me regarding coverage. And I researched their policy and called them, as early as the exact day the 530G was released and as late as the day I was told that coverage may be an issue, and was told I would be covered. I called United Healthcare and they told me it would be covered. I was told that a pump is a pump, Medtronic Minimed is a contracted distributor, and the 530G has the same code as the Revel, the Ping, the t:slim, or any other pump, and that they don’t recognize (or care about) the difference. Also, a quick Internet search shows that others have gotten coverage for the 530G pump via UHC. So I expected to sail through the processs and get my anticipated approval. And finally get away from the limbo of having a “loaner” pump and get one free and clear, in my name, with no restrictions. I’m not quite sure what I’m going to do. But I’ve got decisions to make, and I’ve got a fight on my hands. And this could get ugly. I’m just not sure I’m up for the challenge. 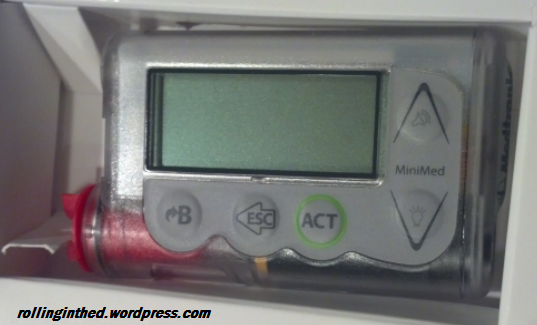 Question for my readers: Do you have United Healthcare and have you tried to get coverage for a Minimed 530G pump? Please leave a comment, or if you prefer, contact me privately. It would be a big help. Posted on October 23, 2014, in Diabetes, Insulin pump, Type 1 and tagged insurance. Bookmark the permalink. 13 Comments. I think this is too insane to not work out into some kind of elaborate gift basket/apology. Rage boiled in me for you. I always wonder if a cancer patient, who wishes to take a pill form of chemo instead of IV form, if available to them, gets dicked around as much as people with diabetes do in their care decisions. I mean, if the two cases got out in the public under scrutiny, which do you think would have more public uproar? They’re similar. They’re both ways to administer life sustaining drugs. Just more convenient. I am not comparing cancer and diabetes here, I am comparing the public and thus the health insurance capacity for understanding the trials making difficult decisions about our self care. I am so frustrated for you! FIGHT for it. They don’t have a reasonable answer!!!! How do you pronounce “argyyuggggggggguggggggggg”? Yes, the lack of coverage pisses me off. Being misled pisses me off even more. Realizing that medical device companies are less likely to develop new products because insurance is less likely to cover them (just another obstacle after the FDA) pisses me off most of all. I am an Animas One Touch Ping / Dexcom user myself, as you know. We all have our preferences, but the the 530G works for you, I say, FIGHT! UHC has a history of denying things, but it’s probably the policy that your coverage is under that is the problem here. Especially if it was tweaked since the time you got your Revel pump. If your wife’s plan is self insured (the company pays the claims & pays UHC for administration), you might have a little more success appealing there. Ask them for an exception (you have plenty of good examples of what the 530g does for you), or to rewrite that part of the policy. Otherwise, you’ll have to fight with UHC. Also, don’t discount the fact that Medtronic has a vested interest in seeing your 530g system approved. No approval, no sale. That’s a big enough reason for them to get involved on your behalf. If I can help at all, please let me know. Good luck winning the fight for something you already use and that has a verifiable track record of helping you. Actually, I think it’s just the opposite. Medtronic warned me that UHC has a tendency to deny all 530Gs, but I believed that my coverage, which is very good, would allow it. And yes, they (MedT) told me I could appeal to her company to pay for it, but I think that would be tough considering (1) it’s a big, bureaucratic company and (2) I’m not the employee, and don’t have access to the same resources/online HR websites/etc that she does. Medtronic is definitely trying on behalf of their patients with UHC on a large scale, but not as much on an individual scale (which is why I continued to insist – apparently incorrectly – that *my* policy would be different). And until that large-scale effort bears rewards, they spend their time filling orders for other, more cooperative, insurance companies. Thanks for the offer to help. I’m not so sure what you’d be able to do though… I’m still trying to figure out what *I* will do. My understanding is that the Enlite sensors will work with the Revel but don’t know whether it’s suboptimal because the software is different. I can’t believe that you are going through this and I’m so sorry that you are. You should methodically prove to them that they should provide this for you. I know you can do it. And yes, I agree that you should definitely get Medtronic involved. As I mentioned above to Stephen, they are involved, but they’re focused on fighting one big battle rather than hundreds of identical little ones. Personally, I’m not sure which approach to take; but I think the argument of “better treatment” never works. I’ve either got to take the financial approach or the “it works just as well as the old one” approach. If UHC could negotiate a rate with Medtronic for the 530G (I’m sure they have one) that is identical to the negotiated rate for the Revel, I’m not so sure we’d be having this discussion.